WASHINGTON/SEOUL - U.S. President Donald Trump on Thursday sought to placate North Korean leader Kim Jong Un after Pyongyang threatened to scrap an unprecedented summit, saying Kim’s security would be guaranteed in any deal and his country will not suffer the same fate as Libya under Moammar Gadhafi. Trump said that as far as he knew the meeting with Kim is still on track, but that the North Korean leader is possibly being influenced by China after two recent visits there. Trump distanced himself from comments by National Security Adviser John Bolton that North Korea cited when casting doubt on the summit, which is planned for June 12 in Singapore. “North Korea is actually talking to us about times and everything else as though nothing happened,” Trump said. He was speaking to reporters at the start of an Oval Office meeting with NATO Secretary-General Jens Stoltenberg. Trump said he is not pursuing the so-called “Libya model” in getting North Korea to abandon its nuclear weapons program. Bolton had suggested the Libya model in comments Sunday, prompting North Korea to threaten to cancel. Gadhafi was deposed and killed after Libyans joined the 2011 Arab Spring protests, aided by NATO allies who had encouraged him to give up his banned weapons of mass destruction under a 2003 deal. Analysts have suggested Pyongyang will have bristled at the notion North Korea could suffer the same fate if it makes concessions on its nuclear program. Trump said the Libya model will only come into play if a deal cannot be reached with North Korea, but did not elaborate. “We cannot let that country have nukes. We just can’t do it,” he said of North Korea, which has been working on missiles capable of hitting the United States. The United States has demanded the “complete, verifiable and irreversible” dismantlement of North Korea’s nuclear weapons program, which Pyongyang has rejected. North Korea has given no indication that it is willing to go beyond statements of broad support for the concept of denuclearization. It has said in previous, failed talks that it could consider giving up its arsenal if the United States removes its troops from South Korea and withdraws its so-called nuclear umbrella of deterrence from South Korea and Japan. Trump told reporters that if the meeting with Kim happens then “it happens” and if not the United States will go on to the next step. Again, he did not elaborate. Any cancellation of the summit, the first between U.S. and North Korean leaders, would deal a major blow to what could be the biggest diplomatic achievement of Trump’s presidency. 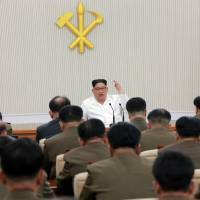 Meanwhile, also Thursday, North Korea strongly criticized South Korea over ongoing U.S.-South Korean military exercises and said it will not return to talks with its rival until Seoul resolves its grievances.The comments came a day after North Korea canceled a high-level meeting with the South because of the drills. The North’s threats to both the U.S. and South Korea cooled what had been an unusual flurry of diplomatic moves from a country that last year conducted a provocative series of weapons tests that had many fearing the region was on the edge of war. It also underscored South Korea’s delicate role as an intermediary between the U.S. and North Korea and raised questions over Seoul’s claim that Kim has a genuine interest in dealing away his nukes. Analysts said it is unlikely that North Korea intends to scuttle all diplomacy. More likely, they said, is that it wants to gain leverage ahead of the Kim-Trump meeting. Ri said the “extremely adventurous” U.S.-South Korean military drills were practicing strikes on strategic targets in North Korea, and accused the South of allowing “human scum to hurt the dignity” of the North’s supreme leadership. He was apparently referring to a news conference held at the National Assembly in Seoul on Monday by Thae Yong Ho, a former senior North Korean diplomat who defected to the South in 2016. Thae said it is highly unlikely that Kim will ever fully relinquish his nuclear weapons or agree to a robust verification regime. Hours earlier, South Korea said it was pushing to reset the high-level talks with North Korea and planning to communicate closely with the U.S. and North Korea to increase the chances of a successful summit between Trump and Kim on resolving the nuclear standoff. The South urged the North to faithfully abide by the agreements reached between Kim and South Korean President Moon Jae-in in their summit last month, where they issued a vague vow on the “complete denuclearization” of the peninsula and pledged permanent peace. Unification Ministry spokesman Baek Tae-hyun said Seoul believes North Korea remains committed to improving relations. “We are just at the starting point and we will not stop or waver as we move forward for peace in the Korean Peninsula,” Baek said. Senior officials from the two Koreas were to sit down at a border village on Wednesday to discuss how to implement their leaders’ agreements to reduce military tensions along their heavily fortified border and improve overall ties, but the North canceled the meeting. Annual military drills between Washington and Seoul have long been a major source of contention between the Koreas, and analysts have wondered whether their continuation will hurt the detente that, since an outreach by Kim in January, has replaced the insults and threats of war. Much larger springtime drills took place last month without the North’s typically fiery condemnation or accompanying weapons tests, though Washington and Seoul did tone down those exercises. The North’s news agency said the U.S. aircraft mobilized for the current drills include nuclear-capable B-52 bombers and stealth F-22 fighter jets, two of the U.S. military assets it has previously said are aimed at launching nuclear strikes on the North. The allies say the drills are defensive in nature. Seoul’s Defense Ministry said F-22s are involved in the drills, but not B-52s. Ministry spokesman Lee Jin-woo said B-52s had never been part of plans for this year’s drills, focused on pilot training, denying media speculation that Washington and Seoul withdrew the bombers in reaction to North Korea’s allegation. 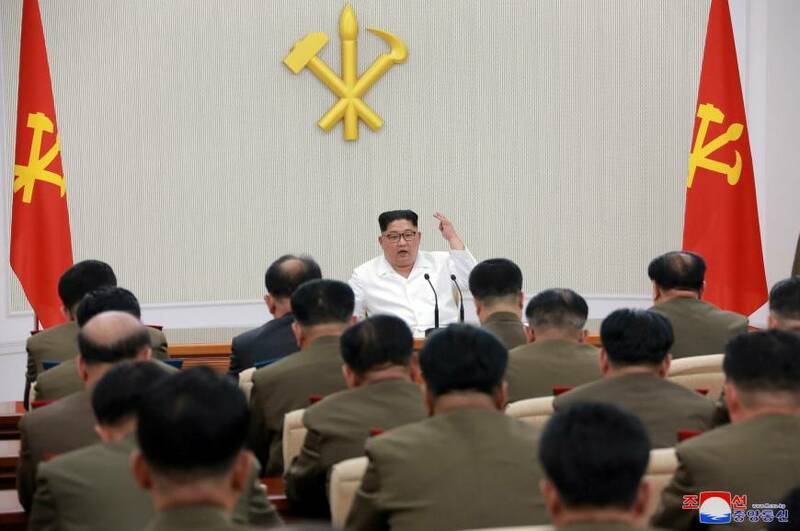 Kim told visiting South Korean officials in March that he “understands” the drills will take place and expressed hope that they will be modified once the situation on the peninsula stabilizes, according to the South Korean government.